It looks like the next season of Netflix’s Stranger Things is going to be even darker than the previous two while also taking some new risks. The series racked up 12 Emmy nominations on Thursday including Outstanding Drama Series for the second year in a row. Emmy nominated for Best Supporting Actor, David Harbour who plays the determined Hawkins police chief, Jim Hopper had some intriguing information about the cinematic themes of the third season. “I would go look at the great films that were released in ‘85,” Harbour told Deadline. “Of which there are many, and just go down the list and think of the possibilities that we could be going with.” Harbour added that he thinks the next season is specific to 1985 and the references that are included in that year.
? I would definitely appreciate it if Dustin or anyone else from the gang references The Goonies. It looks like there could be many possibilities that the series could pick from the box of the 1985 pop culture. 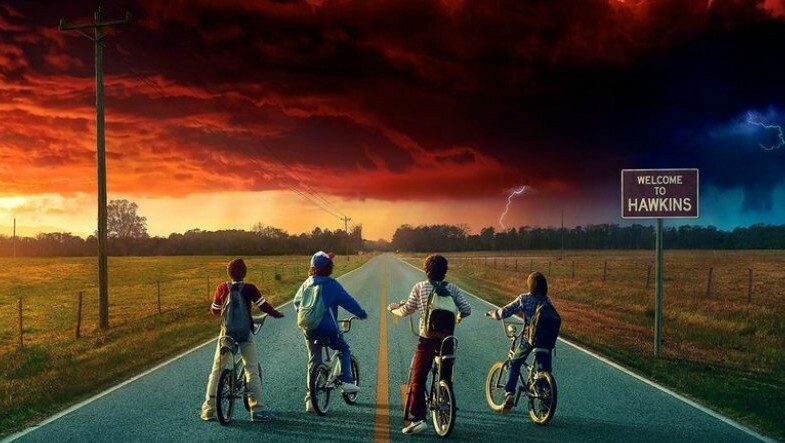 While Harbour describes season 1 as a reference to Stephen King novels and season 2 as a reference to Spielberg films he adds that the next season is staying some risks. Harbour states that while you saw a swashbuckling version of Hopper in season 1 and a softer version in season 2 there will be a combination of the two versions in season 3. Noah Schapp, who plays Will Byers on the show revealed more new details last month about the next season in an interview with The Hollywood Reporter. He even let slip that there will be a storyline that involves Lucas’s little sister Erica and another character. He also mentioned that there should more of “Dad Steve” which is something I would definitely want to see again. “It’s very different this season because it’s in the summer, so you kind of get to see a different version of everyone,” Schnapp said.“It’s great because it has a lot of the dark parts from season two and a lot of the light playful parts from season one. All this information makes me even more excited for season 3 but since the show is probably going to be released some time in 2019 it looks like I’m going to spend the time rewatching 1985 movies to find out what’s in store for the next season.